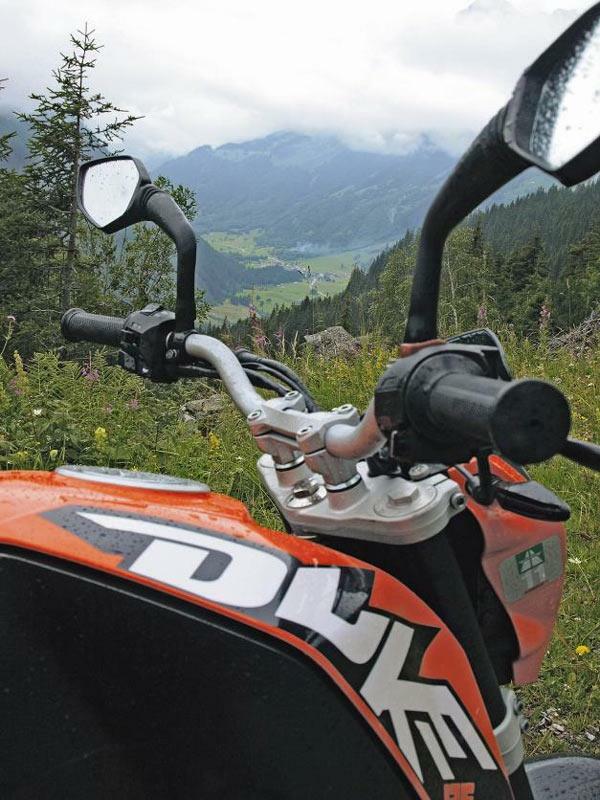 This July I rode from Oundle (Cambridgeshire), to Interlaken (Switzerland) and back on my 125 Duke. 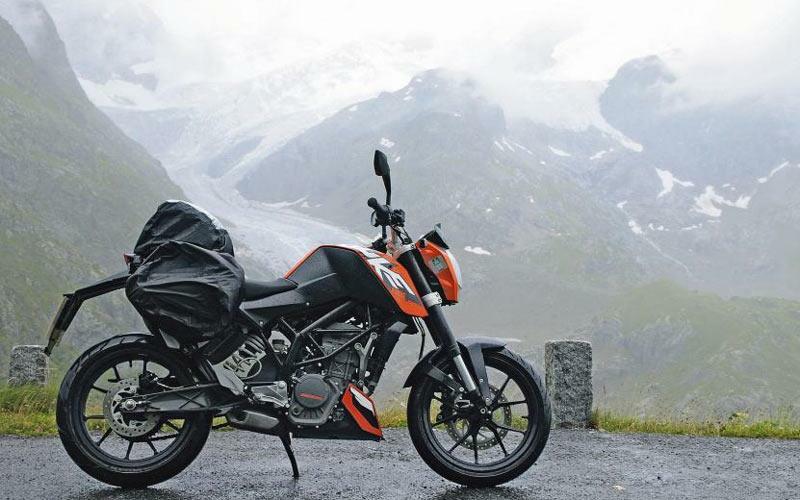 The 2,000 mile, six-day route took me across country lanes, motorways, city streets, alpine passes and grassy fields, which the tiny KTM managed with aplomb. This – of course – is nothing new. Plenty of low-capacity bikes head off on high mileage odysseys every summer. But this may be the first time anyone has toured on a KTM 125 Duke. The result? It’s a pleasure. A treat. It’s a fun, lightweight, unthreatening run-around that sips fuel (200+ miles from two gallons), hardly burns any oil, and gives you the all-day comfort you need to get the job done. 15 horsepower might not sound like much, but it’s 14 more than Lord Byron or the Duke of Wellington had, and they got about a bit. Loaded with a couple of soft panniers and a trim tail pack it’ll even hold enough camping kit and clothes for one person with ease. The only challenge the Duke couldn’t help me with was the weather… My journey started in a sodden England, continued into a lashing France, head-first into a torrential Belgium, onto a soggy Luxemburg and finally skidded into a waterlogged Switzerland. In between that it was raining. In my corner I had a brand new Hein Gericke “Tricky 4” suit, a warm piece of Gore-Tex kit that kept my vitals bone dry through the wettest week I’ve seen since hiking in Chile. 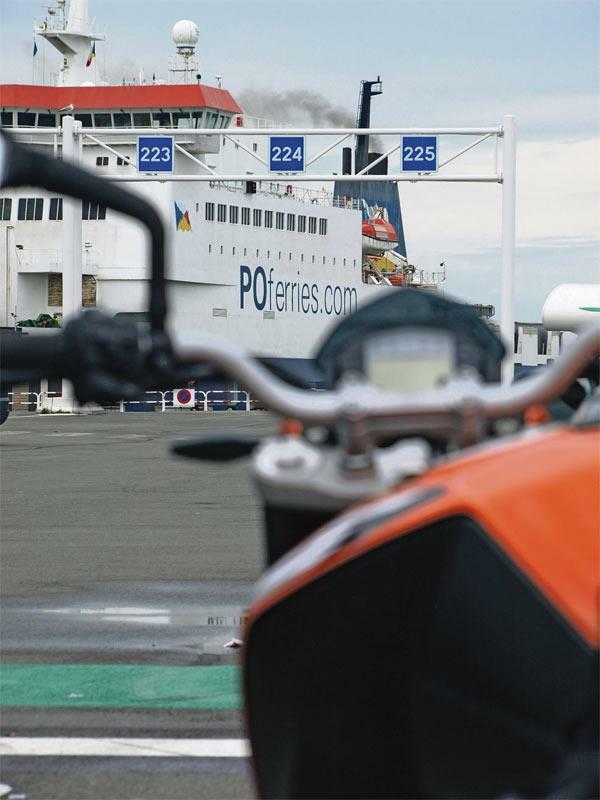 After a misty but comfortable crossing of the Channel (courtesy of www.poferries.com), ex-MCN Web Producer James Keen and I headed across the moist plains of Flanders to Belgium. I can’t say I’m happy his Vespa 300 GTS outgunned me, but I’m confident I looked cooler. We arrived in Bruges about as wet as if we’d swam there. To overcome the biblical downpour, Keeno and I did the only logical thing: boozed. Bruges is the perfect place to do this. It’s littered with cosy little cafes and pubs, most with table service, some with open fires and all offering enough high-percentage beers to make your eyes water… which is how we found ourselves on a fresh and bright Sunday morning in “the Venice of the north” with heads like smashed conkers and guts full of souring “Zot”. By lunchtime, Keeno was en route to London through yet another approaching downpour, I headed down to the Alps, via Nancy. Realistic cruising speed may have been a mild 62mph, but the gentle rhythm of the road proved to be a real pleasure. A couple of days later I was in the village of Lauterbrunnen - overlooking the Staubbach falls – and ready to conquer the Alpine loop of the Grimsel – Furka – Susten passes on way to the warm vineyard lined valley settlement of Aigle and the chique lakeside town of Montreux. The Duke managed them all without a stutter, and on the wet Swiss switchbacks it really came into its own. No weight, no worries, no stress. As easy to handle and flick about as a BMX bike, all overlooked by the misty Jungfrau and Eiger. The only time I longed for a Sprint ST was returning across the plains of eastern France. You know the ones. The land between Besancon and Reims that makes Norfolk look like New York. But even then the soft rain-less skies – and the sounds of Bob Marley and Bruce Springsteen - made for some peaceful riding. Oh, and if you order a Fondue in Switzerland (and you should), do not eat the bowl of green jelly they’ll shortly bring out. It’s a toxic chafing fuel they’ll set alight to keep your molten cheese hot. It’s not nearly as tasty as Fondue and you’ll get a lot of funny looks.